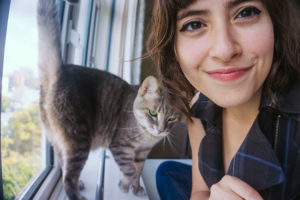 I’m going to cut to the chase here and let you know: there don’t seem to be a lot of reputable sources online discussing exactly why our feline friends like to chase and hunt string. 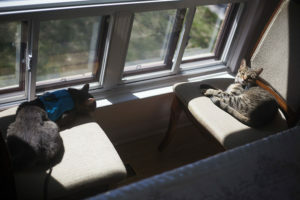 There’s absolutely no way anyone could deny the attraction cats have to yarn and other string-like objects; at the same time, when it comes to explaining why, the jury’s still out and all we really have are our own theories. I have a few of my own, and I’ve scoured the net to find as many theories as I could – but keep in mind: all of these may be right, or none of them may be right. It’s only science that can help us figure out the true answers. Either way, I really enjoy coming up with theories that could plausibly explain away quirky cat behaviours, like why they like to sit & lay on paper, why they’ll often follow you into the bathroom, why they frequently stare at you in an unwavering, creepy gaze, sometimes bite, then lick you while you’re petting them, and why many sleep at the very foot of the bed. They sure can seem like oddballs from the perspective of a human, especially considering a lot of them seem to do these types of behaviours when you may at first expect they’re just a quirk of one specific cat’s personality. But I find the more you think about these strange behaviours, the more they start to make a little sense. 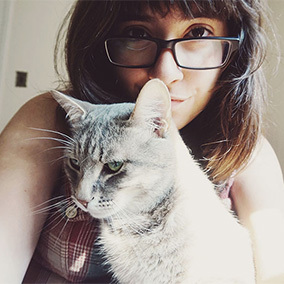 Discussing them is really fun to me because really adorable stories often surface when pet parents describe how their cats individual personalities shine through while still doing these stereotypical cat behaviours. And I actually just truly enjoy discussing theories because I think it’s fun to uncover potential explanations that may give us a better understanding of our feline friends. Here’s the list of theories I’ve made and/or uncovered scouring the internet. Have a theory of your own related to why cats often really like string? Please take a moment to share it with me in the comments below! 1. 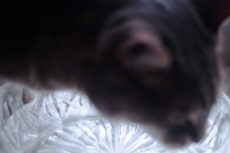 Cats have evolved to pay close attention to movement; string moves in an interesting way. The way string moves is absolutely enough to catch any kitty’s eye. Even my lazy Avery, who often completely refuses to engage in playtime will still sit watching string twirl and the movement of almost any type of string alternative. He can be pretty transfixed on it, as it holds his attention even if he isn’t particularly interested in playing at the moment, so I definitely think there’s something about the way string moves that draws and holds a cat’s attention. 2. The size & shape of string & yarn may remind cats of the tails of their prey – like mice or lizard tails. This is probably the most obvious theory in my mind. It’s often true that cats will go so far as to be attracted to string and even electronic cables, cords, and wires that are simply lying on the ground. Some cats will bite and chew on wire, other cats will begin to play with yarn that’s lying on the ground on their own. It doesn’t have to be moving to attract a cat’s attention. Thus, in my mind, there has to be something to this theory, and there has to be something about the visual of a string or wire that attracts cats to it. 3. The combination of movement and shape may drive cats’ instinctual prey drive into hunting mode frenzy. 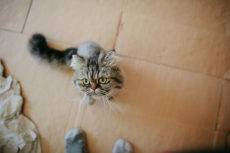 It may be that the combination – the way string both moves and looks – hit the nail on the head in terms of attracting a cat, and that this combination is way more powerful than the movement or visual attraction on their own. How could this be? Imagine your favourite dessert, then a second dessert you like, but aren’t obsessed with. In the case of your favourite, chances are the texture and taste of the dessert are both incredibly on point for you. With the less-than-perfect dessert? My guess is you either like the taste a lot, or the texture a lot, and the lack in one department or another means you aren’t the most obsessed you could be with the whole shebang – at least not in the same way as when both taste and texture score high points at the same time. The same could be true of cats in terms of why they love to play with string when compared to other toys. 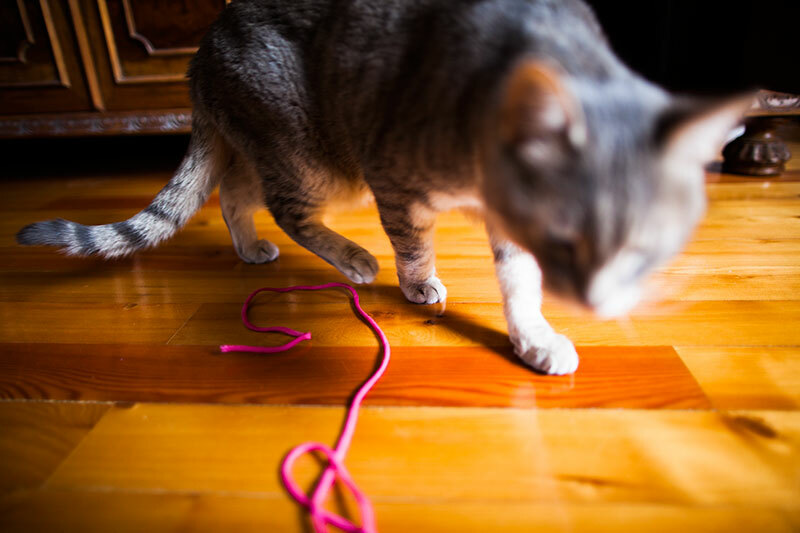 They may like the way one toy moves, and the way a different toy looks – but when it comes to string, yarn, and other alternatives, the movement and the visuals are both on point, putting them overboard in terms of loving string as a plaything. 4. The feeling of catching the string, is potentially incredibly satisfying, making a cat want to do it again. The sensation of a cat catching a prey is likely incredibly satisfying for a cat. This may not be any different from other toys cats catch, like feather wands, but it certainly is different from toys like laser toys, which cats can never physically get their hands on. Who knows – maybe there is something special about string, however, and the satisfaction cats get from particularly catching this thin, hard-to-keep-hold-of shape. 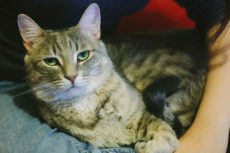 Maybe cats have evolved to enjoy the challenge of keeping a prey’s tail in their claws, making them go overboard in terms of wanting to try to catch and keep that tail as long as they can. 5. The sensation of the particular texture of some string – like yarn – likely is also highly attractive to cats. Cats love the texture of wool, and yarn often feels very much the same way to touch. 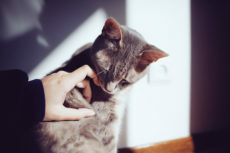 Similarly, cats often really enjoy biting & chewing plastic, and since wire feels like a rubbery plastic, it’s likely the texture plays a role in how attractive it is to cats as well. Maybe the texture wouldn’t initially attract a cat to begin to play with a string-like object, but once a cat gets started, I can imagine the texture would help a cat want to continue to try to catch and feel that interesting texture on its paws. Would be interesting to test this theory out by having essentially the same size, colour, and shape of string, but in different materials, used to play with a slew of different cats. If this type of study was to take place, I would guess some textures would be much more enthusiastically played with than others. 6. Cats may have evolved to kill snakes – competitor predators – to increase the amount of prey they may have; string may remind them of snakes. I’ve seen this theory floating around, and it makes sense to me. 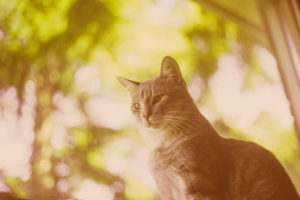 Cats that evolved to enjoy hunting, killing, and eating small, safe-to-kill snakes must’ve had a much easier time staying alive in their environments than those who evolved to avoid snakes at all costs. By enjoying the act of hunting, killing, and eating snakes, they would be unwittingly assuring more to hunt for themselves, as small snakes and cats hunt much the same things: small birds, rodents like mice, reptiles like lizards, and amphibians like frogs. 7. It may simply be fun to chase string, like kicking around a ball is fun to humans. 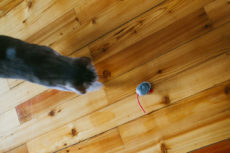 Chasing around string absolutely simulates hunting through play, but it also may be fun in and of itself, like throwing or kicking around ball is fun for humans. There’s a lot of things humans like to do because it’s mentally or physically stimulating, and while in large part what we like to do helps us improve our physical reflexes and abilities, it’s also true that in part we play because we plainly enjoy doing so. For cats, the same is almost certainly true. 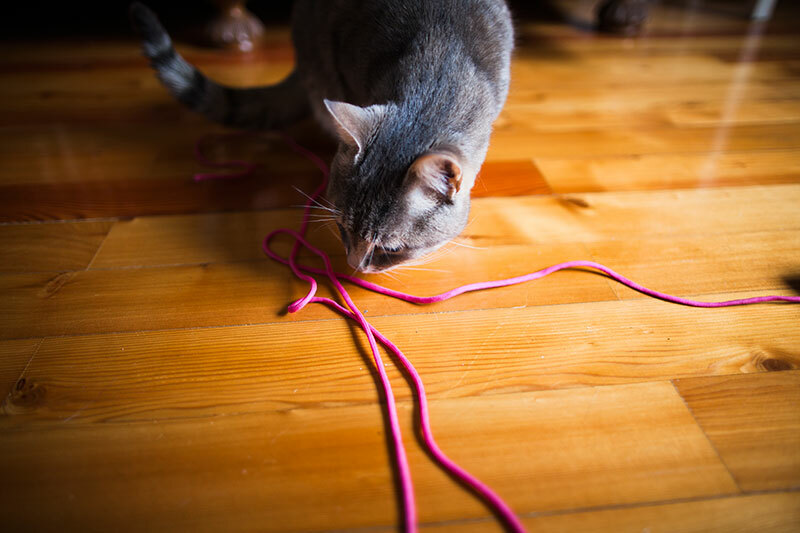 Of course, you likely already know this, but if you have cats who enjoys picking up and playing with string on their own, please make sure you don’t leave string and/or alternatives out for them to play with out. String makes a terrible home alone cat toy because cats can accidentally strangle themselves with it, or even swallow it if they enjoy chewing it. 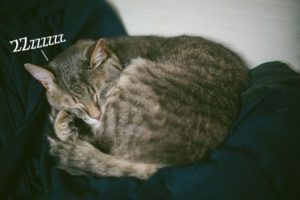 Cats need surgery to remove the string if they happen to swallow a part of it, as string can do massive damage going through the internal organs of a cat on it’s own Keep this in mind, as if your cat ever swallows string or anything string-like, you’ll need to take him or her to the emergency vet immediately. 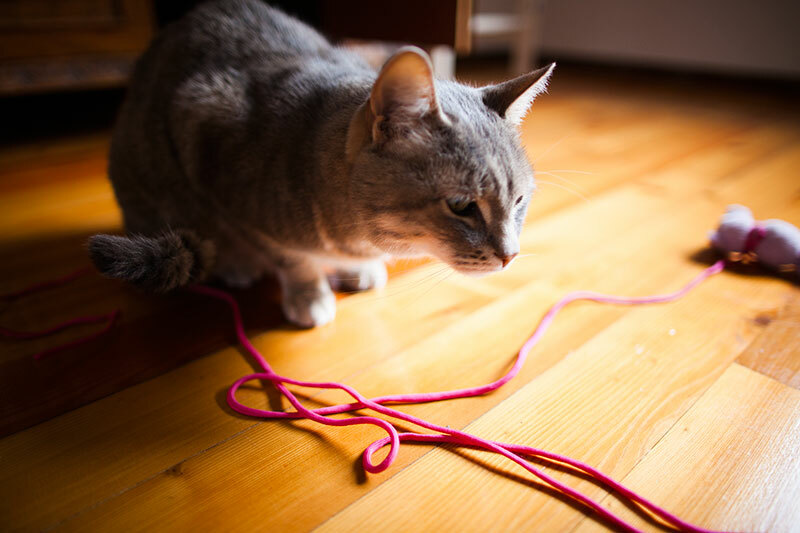 Looking for safer alternatives to string that you can play with (supervised and monitored at all times still) with your cat? 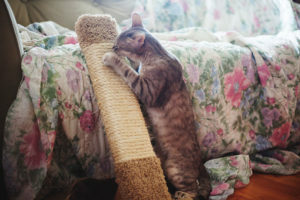 Check out my article on yarn alternative cat toys. My favourite option of the few excellent options I’ve found? 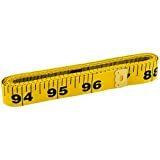 Soft measuring tape– the type used by seamstresses and clothing designers to measure for making and adjusting clothes. If you go this route, you absolutely should make sure if there’s a metal bit on the end, cut it off before using it to play with your cat. The vinyl texture and shape of soft measuring tape cats seem to love to chase and catch, I’m guessing in part because of how it feels and moves and in part because of the quite interesting sound this type of tape makes when you run it along the floor. 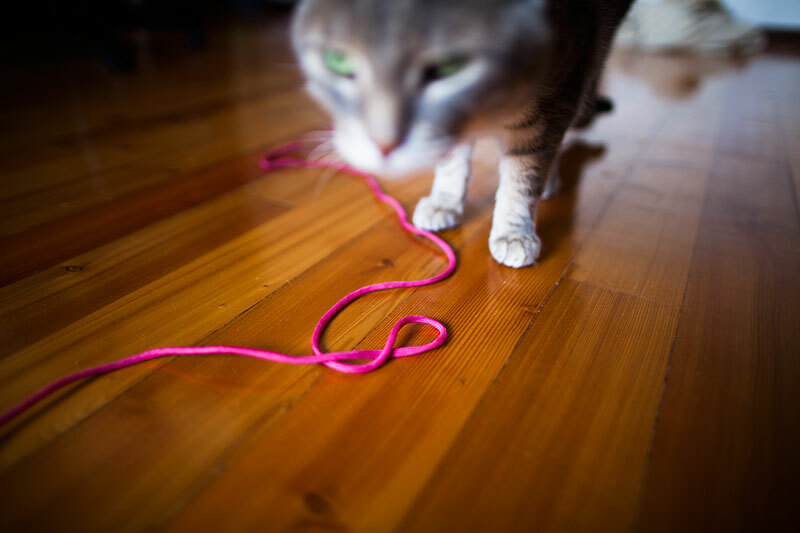 Have any more tips for cat owners of kitties who love string? Leave them in the comments down below! Your Thoughts on Cats Liking String? 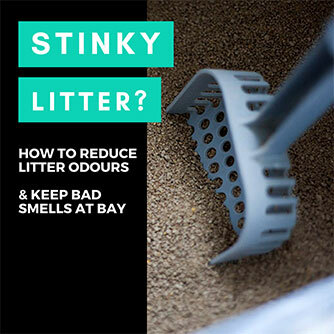 Do your cats favour string-like objects over most other cat toys? Do your cats try to chew cords and wires as well, or simply have attraction to string-like objects that move? Are there any theories you can think of that I left out? Any of the theories I listed you think are unlikely to be true? Any you think are more likely than others to be the largest reason why cats like string?